The UK has over 700,000 people of Indian decent but the choice of Indian TV is extremely limited. Many Indian TV networks stream their content online but unless you’re physically in India you’ll be blocked from viewing. In this guide we’re going to show you how you can access Indian TV channels online from the UK using the most simple method. Indian TV channels such as Hotstar and others stream content online and if you’re in India you can simply visit and watch. The good news is you can bypass these blocks by using a simple tool. This tool is called a VPN which is short for Virtual Private Network. Just follow the instructions below and you can watch Indian online TV such as Hotstar and others in the UK or anywhere else in the world. Click Get ExpressVPN and sign-up to their service. Go back to the main ExpressVPN website and click Products. Download the correct app for your type of device. They support Windows, Mac, Android, iOS and Amazon Fire TV Stick. Install and run the software or app. Press Choose Location, click All, click Africa, Middle East & India and select India. The software or app will take between 15 and 30 seconds to make connection. Once it has connected any website you visit or TV channel you watch online will think that you’re in India rather than the UK or anywhere else in the world. Rather than see the block message you saw earlier in the Hotstar example you’ll be able to watch freely. There are plenty of other VPN providers available too. ExpressVPN scored one of our highest review scores this year which is why we recommend them for watching Indian TV channels in the UK. They also have VPN servers in Bangalore, Hyderabad, Indore, Mumbai, New Delhi & Pune which gives you plenty of options when connecting to India. Every internet connection is assigned something known as an IP Address. An IP Address is similar to a phone number in that it’s unique to you at the time of connection. They help all the bits of data on the internet know where they should be going and who requested what. Unfortunately an IP Address also gives away your physical location. Using a VPN allows you to change your IP Address to one from another country which is what helps you watch Indian TV channels in the UK. 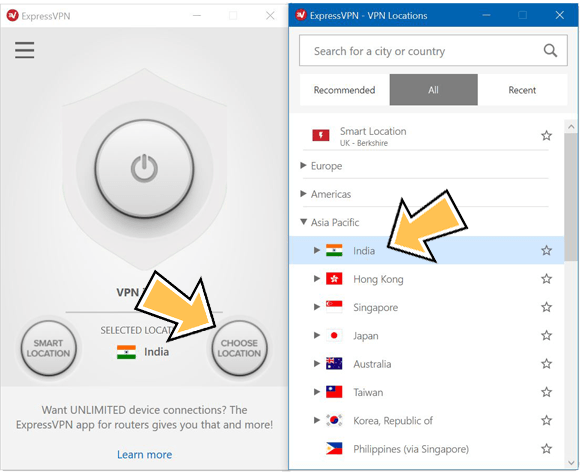 There are plenty of Indian TV channels online that you’ll now be able to access with a VPN as explained above.